PurpleMoon for Relay for Life | ! *PurpleMoon Creations* ! This year I chose to be part of a fabulous event which raises money for one of the most meaningful charities for me, Relay for Life. I decided to become a sponsor of the "SL Christmas Expo" organized by many volunteers from SL’s RFL Volunteer group. This Expo features some new and fun special events, an estimated 100 vendors and amazing Holiday splendor to 4 regions. The expo will be open until December 18th 2011. And these are my items that I hope you like. 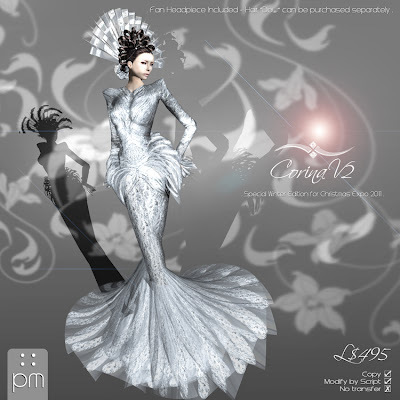 I created a special version of the gown "Corina" in a winter theme, it will make you look like the Snow Queen! And also, I put out a new hair attachement named "Dew" which comes in four basic shades, includes hairbases and a menu to customize the hair piece that comes with it. Allowing you to choose from 12 string colors and 17 metal beads!